Weather-proof backpack comes with a full-size top flap to cover main compartment zipper opening. Each side of the flap is extra wide and deep which can also work as additional side pockets. Large front zipper section. Organizer inside contrast color pleated front pocket. 4 compressions straps. Additional hipbelt with zipper pocket not only can help to re-distribute the weight off the shoulders but also store small items for easy access through the front. Ergonomic padded back panel and shoulder straps. The alpine backpack has dual main compartments, large vertical opening front pocket, and one top zipper pocket which also allow easy access to CD player or other small loose items. Organizer pockets included. 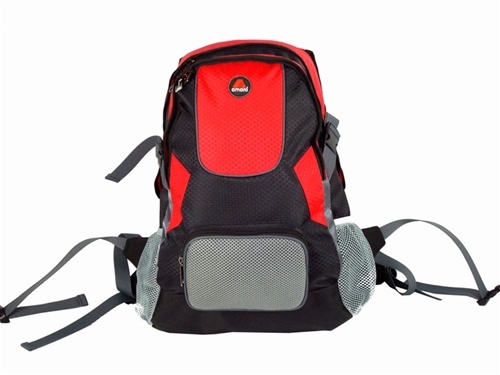 Ergonomic design padded back and shoulder straps with back support. Hip-belt with zip pocket for stability. Dual adjust sternum strap. Compression straps on both sides and bottom to secure contents. Elastic side mesh pockets are great to fit water bottles in 1-quart size. It's a true multi-purpose backpack for campus or on the trail. The Element Backpack is a light weight backpack but loaded with large compartments and many features. Fully lined interior with large elastic pockets. Organizer inside front zipper pocket. Two large side elastic mesh pockets. Additional large open pocket with clip closure. Small zipper pocket for easy access small items. Fully padded back and shoulder straps. Additional hip belt and chest clip for ergonomic support. This backpack is great to use as corpoprate gift by adding the custom logo on the lower front zipper pocket. The Oxygen backpack is a functional backpack for students and the workplace. It features an ample zipper compartment fastened by two adjustable compression straps. Dual side elastic mesh pockets for water bottle holder. The front zipper pocket features an organizer. Bungee cord on the front pocket to secure extra belongings. Air Mesh padded back panel and shoulder straps with adjustable chest clip for comfortable carrying support. Disclaimer: Water bottle and other items shown for display purposes are not included with this item. The Summit backpack is a light weight backpack ideal for work and school. Large zipper compartment with dual side elastic mesh pockets secured by two adjustable compression straps. Organizer inside the front zipper pocket. Padded back panel and shoulder straps with chest clip and adjustable hip belt for maximum carrying support and comfort. Contrast color center panel for easy identification. Disclaimer: Water bottle and other items shown for display purposes are not included with this item. The Hybrid backpack is a full featured versatile design that can be carried over the shoulder or by hand utilizing the handle on the front pocket. It features a large main zipper compartment secured by two adjustable compression straps with buckle closures. Organizer located inside the front zipper compartment. Two vertical roomy zipper pockets on the front for easy access to small items. Dual elastic side mesh pockets. Padded back panel and shoulder straps with chest clip provide comfortable and ergonomic support. Adjustable hip belt. The Hybrid is great for school, work, and outdoor activities. Disclaimer: Water bottle and othr items shown for display purposes are not included with this item. Durable mid-size backpack constructed in 300 denier Hexagon ripstop material upper body and heavy duty ballistic nylon bottom panel. Inside main compartment has heavy padded laptop sleeve. Back panel is padded with thick air mesh. Contoured shoulder straps with chest clip for additional ergonomic support. Organizer pouches inside front zipper compartment. Extra webbing handles on both ends for easy carrying. Elastic mesh side pocket. Adjustable hip belt. Compression straps on the side. Additional open flap pocket storage on front. Versatile designed backpack made with 450 denier ripstop polyester and durable ballistic nylon bottom. Inside main compartment has storage sleeve for laptop computer. Two vertical front zipper pockets with daisy-web trim. Extra wide elastic mesh pockets on both sides. Organizer pocket inside front zipper compartment. Compression straps on the side. Contoured shoulder strap, chest clip, adjustable waist belt and heavy padded back panel to provide additional ergonomic support.